First of all, thank you all for the support and votes in the Best Czech Running Blogger competition. You were amazing and helped me win! I do translate your trust in a commitment for myself to provide you with hopefully interesting content and some fun as well :) Congratulations to all the participants, especially Advid (2nd) and 12Honza together with Running Shadow (3rd-4th). I hope we will all keep it up! And huge thanks to Leona for hosting the competition at her blog! I crossed the 50 mile milestone in my weekly mileage for first time ever. 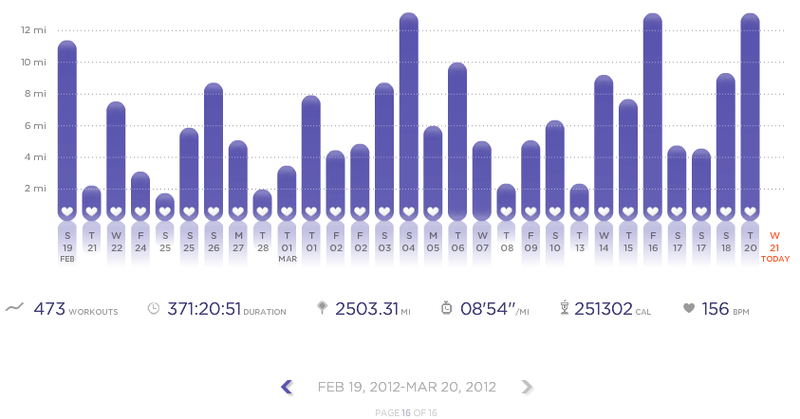 My total mileage just poped above 2 500 miles since summer 2009 (I know this might not seem like a lot for some ultra runners, but I like it :) ). Number 2 translates in the fact that in the metric system, I crossed the 4 000 km marke (nothing to compare with 12Honza's 10 000 km, but yay for Honza and I will be there sometime soon). On a random note: My yesterday's easy long run (13.1 miles) came in with the average pace 9:02 min/mile (5:36 min/km) that is slightly faster than in the NYC marathon where my avg pace was 9:10 min/mile (5:41 min/km). The important thing is that during yesterday's workout, my heart rate averaged at 150 BPM! I am really looking forward to the Hervis 1/2 marathon on March 31 and Prague International Marathon on May 13 to see how this translates in my results. Thans to Radek for making me realize my mental block with going fast! Just to illustrate how great was the weekend weather in Prague. the running total was 50.74 miles. and amazing 15 days 11 hours 20 minutes and 51 seconds of running!!! Boze ty jsi proste dabel :-) Nadherna cisla! Velka gratulace i k vitezstvi v blogove soutezi. Zaslouzila sis to!!!! Summer: Nothing to compare with the triathlon world ... :) This is just one out of three sports. Barborko, jedna otázečka, která mi vrtá děsně hlavou :))). Co je to (asi) modré, co vypadá, že máš zastrčené vzadu za sukní :)?